OSWEGO, NY – The Retired and Senior Volunteer Program, a division of SUNY Oswego’s Office of Business and Community Relations, has announced the addition of 10 master trainers to the Osteo Bone Builders Program. From left are: Nadia Emerson (Brevard County, Florida, RSVP director), Virginia Gilbert (former Albany RSVP director) and Ellen Wahl (Oswego County RSVP director). Six of the newly trained master trainers are osteoporosis (osteo) instructors at Oswego County sites: Rachel Brooks, Ann Hardy, Carol Miller, Carol Simpson, Joan Southwell and Marjorie Flood. Also trained were Sharon Connor (Onondaga County), Sharon Faudree (Red Creek) and RSVP directors Ellen Wahl (Oswego County) and Nadia Emerson (Brevard County, Florida). 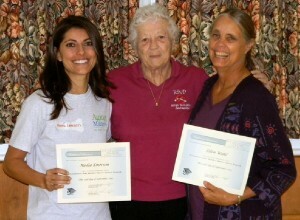 RSVP’s Osteo Bone Builders Program has been in existence 15 years. As with most RSVP programs, it is designed to help people help themselves. In this case, RSVP volunteers are trained to help their peers overcome and control the debilitating effects of osteoporosis and, at the same time, have fun doing it. “Our volunteer instructors don’t necessarily have a background in physical education, but they do have a passion for helping others seek relief — hurting less and enjoying life more,” said Wahl, RSVP’s director. The Bone Builders exercise regimen is designed to rebuild bone density and improve balance. Classes are self-paced and can help those just diagnosed and those with advanced osteoporosis. The Osteo Bone Builders Program was introduced in Oswego County by Virginia “Ginny” Gilbert, then RSVP director of the New York Capital Region. She conducted the first training of RSVP instructors in May 1999. Gilbert first learned of the Bone Builders Program when she attended an alumni reunion at Syracuse University and reunited with a roommate who enlightened her about the program, which was developed by research scientists at Tufts University. It was at this time that Gilbert wondered whether lay people could be taught to lead the classes. Upon Gilbert’s retirement from RSVP, she began her second career as a Bone Builders trainer, traveling the country and teaching the program with great success. Each year she would return to Oswego County and train another class of 12 or more instructors. Bone Builders is now RSVP’s largest volunteer opportunity, having grown to more than 20 sites and 70 instructors just in Oswego County. When Gilbert decided to retire a second time, she scheduled her last training session this past fall here in Oswego County, and added a “master trainer” class to assure the program is sustainable. The class resulted in 10 certified master trainers to continue the tradition, one of whom is Nadia Emerson, RSVP director of Brevard County, Florida. She has a master’s degree in physical education, a background similar to Gilbert’s and said she is excited to be able to launch the Bone Builders program in her county. Gilbert has already introduced the Bone Builders program to parts of Florida, and osteo instructors Nancy James (Cleveland) and Arlene Townsend (Springside) have each started sites in Florida when they wintered there. Certification of Oswego County’s own master trainers means that RSVP will not have to wait until an annual training to install new instructors; it will be an ongoing process. Nationally, RSVP reached its 40th anniversary this year. It is part of a nationwide network of Senior Corps programs, sponsored by the Corporation for National and Community Service. Each of the 700-plus RSVP programs in the United States is sponsored by a nonprofit agency. In Oswego County, RSVP is sponsored by SUNY Oswego and is a United Way member agency. Contact RSVP for more information on programming and/or to receive Mature Living, a free publication with news and information for mature adults living in Oswego County.